It’s not a secret that I am a long time fan of Jeff Rowland amplifiers. I’ve owned almost the vast majority of their preamps, owned and used several power amps and owned the model sixes for almost a decade. During that time plenty other amps have visited but never did any amp fully convince me to part with the aging Sixes until recently that is. I think Hans of HVP Audio deliberately told me very little about the Analog Domain sound to let me discover it myself, but he did tell me that it was very special, different than Jeff Rowland but certainly on the same quality level as the Rowland 625 S2. He need not say more, my interest was sparked! As I was writing reviews about several speakers it seemed the perfect opportunity to review the Analog Domain gear as well while also being able to use them as references for the Wilson and Vivid reviews. 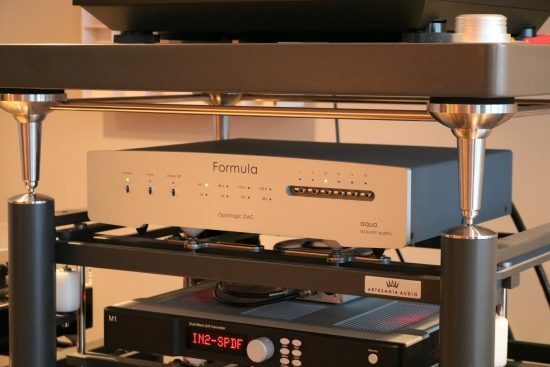 Hans was happy to deliver the M75D integrated and M75P power amplifiers and mentioned that he also happened to have a Jeff Rowland model 625 S2 in his car, which he kindly also included for comparison. Having recently sold the Apogee Divas and in search of dynamic speakers that could deliver at least part of the Apogee dipole magic, I found a pristine set of used Wilson Watt/Puppy 8, which are the latest in this series, and took a gamble buying them. Quite unexpectedly, I completely fell for these speakers. I was actually aiming to buy new speakers but really did not expect to like the Watt/Puppies as much as I do, so, for the foreseeable future, they are here to stay. 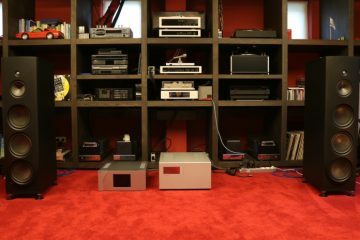 So, armed with the Jeff Rowland Corus + PSU preamp and the Wilson Watt/Puppy 8 speakers as a starting point, using the Bricasti M1 and Aqua Formula xHD DACs I set out to assess the Analog Domain amps, adding comparisons with the Vivids as a bonus. Having lived with the Jeff Rowland model 6 amps for over a decade and having compared them to so many other amps during those years I still feel that they stand their ground in many aspects. Especially their fluidity, refinement and superb treble remain hard to beat even to this day. However, as a result of hearing more astute and dynamic sounds at shows, more and more being drawn to a less filtered, more neutral and more lively and direct kind of sound. Now, of course, there are plenty neutral and direct sounding amps but I also want it to sound fluid, airy, full-bodied as well as dynamic, well-resolved and timbrally convincing. Finding an amp that combines all these aspects is an impossible task. Or is it? Above: due to their massive weight, the Vaics need to be wheeled in on a trolley. The reality that I always preach is that there is no such thing as a perfect audio component. One has to decide which aspects are most important and try and find a matching product. For example, the Audio Research Reference 75 SE tube amp works surprisingly well with the Wilsons and these speakers delivered an incredibly lyrical and emotionally involving conveyance using the VAIC Reference 520 mono’s. The thing is that SET amps in generic have precious little power and only work well with efficient speakers. Even the VAIC beasts with their huge double parallel 52B triodes manage only about 50 watts with limited current and no damping factor to speak of. While they do drive the 92dB efficient Wilsons splendidly within reasonable volume levels, they definitely do not work well with Apogee Duettas at all, at any volume level. Also, they do not have the tightest or most articulate bass, which in my experience so far remains the realm of transistors. Very powerful tube amps can be found of course, with huge transformers and lots of tubes in parallel. But in doing so you quickly lose the directness, purity, and agility that the simpler designs offer. Ok, I can let go of some of my requirements and am willing to compromise, but absolutely need an amp to sound nimble, articulate and dynamic as well as fluid, well-resolved and timbrally convincing. Oh, and I need it to be quick to warm up, be stable and reliable. Oh boy, that still reads like an impossible task. Or is it? 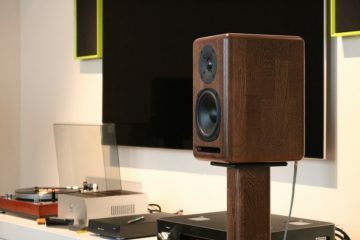 As part of the ongoing speaker reviews there were also various amps on visit: Audio Research Ref75SE, Vaic Reference 520, PrimaLuna DiaLogue Premium, NuPrime ST-10, Bryston 3B, 4B and 14B Cubed, Mola-Mola Kaluga and prior to that also the Ayre VX-5 Twenty. 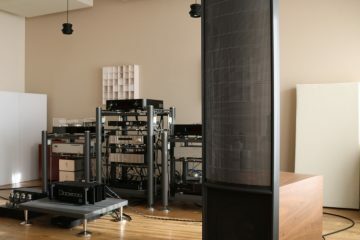 I don’t want to use this article as a shootout between amps, but in order to be able to properly position the Analog Domain amps I have made extensive comparisons and it feels like a bit of a waste not to inform the reader about some of this. So, please indulge me while I explain a little about these other amplifiers. I will arrive at the Analog Domain amps soon! I already mentioned the Class A tube amps further above. Moving on to Class AB, the Ayre VX-5 Twenty probably has Rowland DNA because it is every bit as airy and has even better resolution than the Rowland sixes and that is saying something. The current edition Jeff Rowland model 625 S2 is not as finely refined as the old sixes or the Ayre nor as boldly powerful and dynamic as the Brystons, but it’s not far from either extreme and strikes a very well-chosen balance between the classic Rowland smoothness and modern transparency and articulation. The current crop of Cubed Bryston amps has impressed me by sounding full-bodied, rich, smooth, fluid and timbrally very convincing. In a way, they deliver much of the stereotypical class-A sound without the heat. Lots of articles have been written about switching amps, about their merits as well as their issues and I have also contributed my part. Prejudices are hard to beat. But by now, switching amps no longer necessarily sound overly clean, thin, rough or timbrally synthetic. For example, the Ncore-based Mola-Mola Kaluga power amps are quite costly for Ncore designs but have the fluidity, refinement and treble performance to challenge the Rowland sixes in addition to superb transparency and bass definition. Another great example is the very affordable NuPrime ST-10 which has incredible dynamics, a timbrally full and sonorous tonality and very lifelike instrumental texture. So, in a word: switched amps have come a long way. Ok, having set the stage it is finally time to start with the subject of this review. 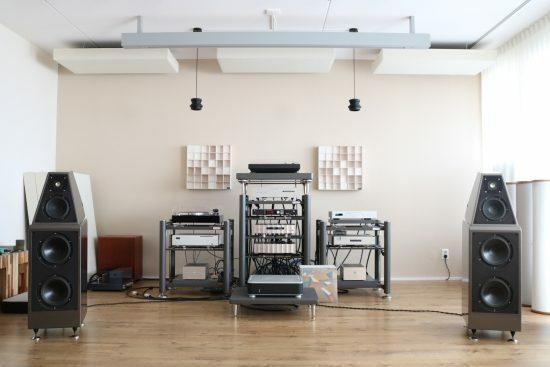 Headed by Angel Despotov, Analog Domain was established in early 2010 in Munich, Germany, with the intention of building audio gear that is able to reproduce recorded sound with ultimate sonic fidelity at realistic volume levels. Ultimate performance and unconditional reliability are two important and invariable features of all the products. Above: no single screw in sight: not even on the bottom! Quoting some more from the brochure: “Management and remote control functionality in the M75D are performed by a high-reliability automotive grade microcontroller (MCU). To keep electromagnetic interference (EMI) to a minimum, all digital drive circuits in the M75 feature slew rate limiting. Furthermore, the microcontroller is completely shut down when not active, including its system clock. If a front panel button is depressed or a command is received from the remote control the MCU will wake up to perform the desired task, illuminating the front panel display to show the operating status. After a few seconds of idling the MCU will shut down, reducing EMI to zero.” Analog Domain is entirely open about the circuits and technology that they use and much more interesting info can be found on their website. It all reads like fanatical attention to detail. 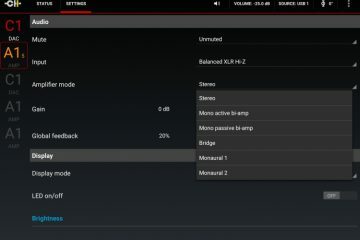 I only wish that provision had been made to choose a setting to allow the display to keep indicating the current volume level. Above and below: the feet can be leveled, or screwed out completely, to reveal the fastening method underneath. Similar to classic Wadias, the Analog Domain M75 series components are assembled by clamping top and bottom plates with 4 threaded ends. All the electronics of the amplifier are biased in class A, except for the output stages. Analog Domain considers heat the enemy, so they aim to keep it to a minimum, and this is why the output stages are not pure class A, and also because they don’t need to be: according to Analog Domain, their proprietary technology achieves the sonic equivalent of pure Class A performance without needing class A amplification. Analog Domain prefers transistors over tubes and believes they can sound just as good and when implemented cleverly, even better. 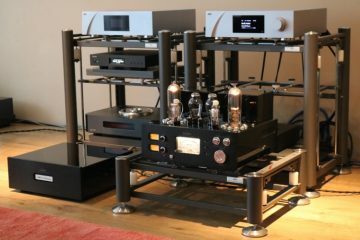 While I would counter that both principles have their respective merits, each catering to different tastes, Analog Domain also indicates that tubes have a limited lifespan and a wide parameter spread for the same model, while transistors have a long service life and consistent quality and there sure is no arguing with that! At this point, I remembered one thing that Hans told me about one of his dealers. According to Hans, the dealer had informed him that Analog Domain (no model mentioned) was the first transistor amp that he was happy listening to after always having used tubes. However, this is a tricky statement because it is open to interpretation. What exactly constitutes tube sound? 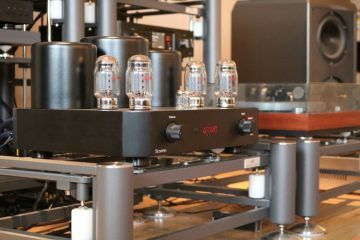 In my view, on the one hand, there are the typically woolly, fat and “tubey” sounding tube amps such many classic tube amps, for examples some amps made by Jadis and on the other hand there are the lively, pure and direct sounding tube amps, such as those from Ayon and VAIC, in particular, the Reference 520 mono’s. The latter have none of the typical tube fatness and no added warmth. They sound pure, lively and direct, but instead of sounding flat like typical transistor amps can do, they really are the most involving amps that I have heard. So, to which kind of tube sound are the Analog Domain amps being likened? I’m sure you had already guessed it… Of course, it is the lively, pure and direct kind. The M75D and M75P are pretty much the same product, the only difference being that the M75D has a preamp section built in and comes with remote control. The power amplifier sections are identical, and both can be bridged and/or interconnected in stereo or mono mode. 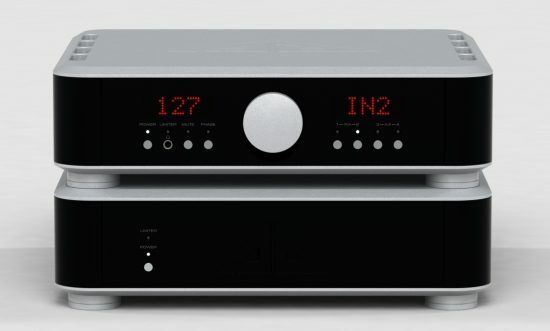 When interconnected, the preamp works for both bridged power amps. Alternatively, using a jumper cable the integrated amp can also be used as a preamp or power amp. Just to be safe, I left the two amps unconnected for a couple of hours, to let them acclimatize to my warm room. I needn’t have bothered though, as the amps are sealed virtually airtight. The amps were both new and had played very only very shortly but unlike source components that I just leave switched on for a week or longer prior to listening, I just had to give these amps a listen right away and listening started with the M75P power amp. Straight from the cold and having hardly played, the M75P matched beautifully with the Wilson Watt/Puppy 8 speakers right from the start. There is no restraint, no hardness, no glare, no blur, no coloration, just clean, pure music in all its enthusiasm and dynamic splendor. 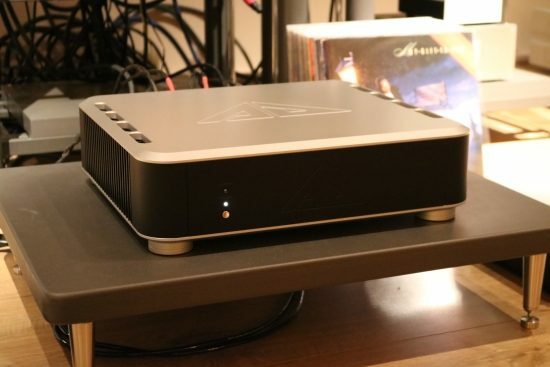 This is a very efficient class A/B power amp: it barely raises its temperature even after prolonged use. According to the manufacturer, it manages to have the advantages of Class A but not the disadvantages such as the heat. The M75P does not sound like a typical class A amp in that it does not have a warmed up midrange but there is also no crossover distortion that I can detect. 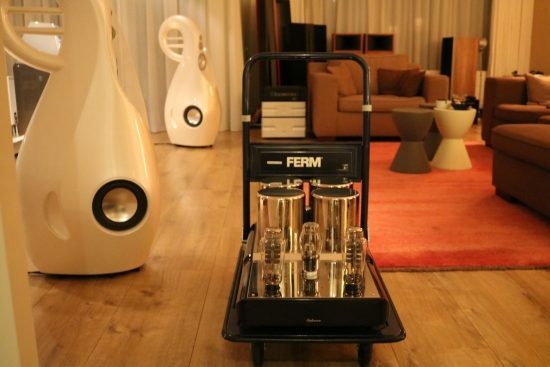 The amp does not sound cold or warm, yet it is timbrally rich and acoustically very lifelike and convincing. Cross-referencing with the NuPrime ST-10, I was happy to find that the Analog Domain has a similarly neutral and timbrally correct delivery. Based on the price difference one would certainly expect the dearer amp to have excellent timbre but you would be surprised how many very expensive amps sound tonally less than convincing. As explained further up, I like my sound pure, honest, tight and articulate and so far the NuPrime holds up perfectly. Both amps are rhythmically strong, timbrally pure and highly engaging. But I also want superb resolution and fluidity from an amp as well as refined treble performance, well knowing that it is probably an impossible task for any amp to deliver on all these accounts. 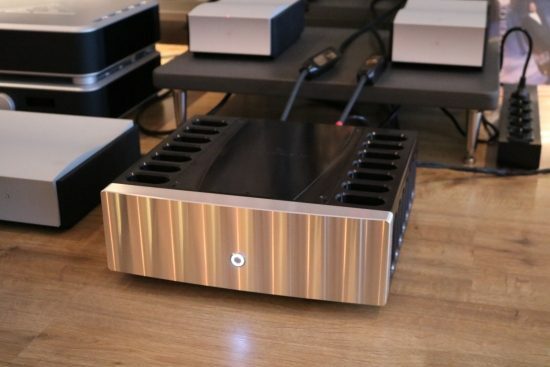 However, sure enough, while not entirely reaching the exemplary low-level resolution of the Ayre, the Analog Domain amp has good resolution and fluid, smooth, non-edgy treble. It’s not the classic Jeff Rowland treble that is always silky, even if the recording is not, but rather the better-textured, more honest kind of treble that recent Rowlands such as the 625 s2 deliver. With the Analog Domain M75P, smooth recordings sure sound every bit as rich, relaxed and refined as they should while rock recordings have all the rough energy that they need. Incredibly and quite contradictory, the Analog Domain amp manages to combine extreme dynamics and raw power with superb resolution and sweet, silky treble. It’s a combination that is normally impossible to find. When you’re young, the loudness button is your friend. But as one gets older, more and more the virtues of neutrality become obvious. More and more, it is neutrality that I crave, and the Analog Domain amp certainly overlays no character of its own, and because of this, it is able to deliver music precisely the way that it is in the recording. Do you want fat bass and creamy-smooth mids? If the recording contains it: no problem. You want relentlessly hard-hitting rock instead? No problem either. Interestingly I could not hear any changes in its tonal presentation after warm up, or after weeks of use for that matter. The amp is simply neutral from the get-go and remains that way. The only thing that I think I heard is that the amp seems to become more lyrical, more emotionally involving if you will, after 30 or so minutes of playing. I tend to switch off power amps after use, but because it is so efficient one could simply always leave the M75P switched on and ready to play. As reference DACs, I use both the Bricasti M1 and Aqua Formula xHD. Both are great DACs, but very different. The Bricasti is a smooth operator with a warm and relaxed sound while the Aqua is a DAC as pure and neutral as they come. In the context of this review both DACs work splendidly but depending on taste, one or the other may be preferred. 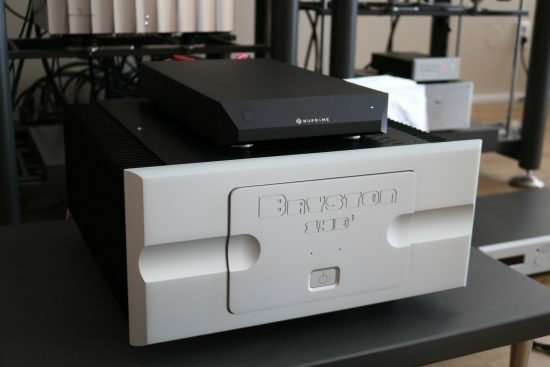 Since the Wilsons are slightly rough and a little forward in the upper midrange, some music can sound more soothing via the Bricasti and some less well-recorded music can have a higher boogie-factor through this DAC, even if it does not offer the same level of transparency as the Aqua. Nevertheless, I tend to prefer the latter because it is simply more accurate and better lets me hear what is really going on. After having listened to the M75P for 2 weeks, my audio buddy Niels was so kind to bring along his Soulution 711 monster amp as part of experiments for other reviews. 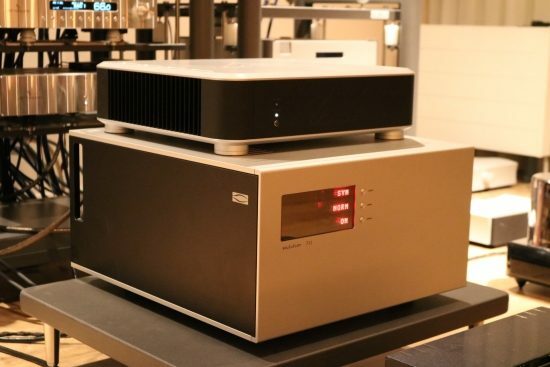 At a whopping 55.000 euro, this is a seriously expensive amp, and perhaps out of context for this review. Nevertheless, I want to mention the 711 for two reasons. First, many people are under the impression that this brand’s amps sound cold and sterile. Maybe this is the case because the amps are often partnered with speakers which themselves have these characteristics or maybe it is because older Soulution products may have actually tended in that direction. Either way, I can confirm that the 711 sounds full-bodied, sonorous and rich and not bright or clinical in the least. Second, Soulution amps are known for their explosive dynamics. As this is one of the attributes currently most important to me, a comparison between Soulution and Analog Domain also has relevance for me personally. The 711 has Ayre-level resolution and the deepest and most well-layered soundstaging heard from a transistor amp so far. And while its sonorous bass, incredibly rich midrange and darkish tonality are quite appealing and in a way analogous to that other camp of tube amps, with the Watt/Puppy 8 or Duetta Signature, it does not sound any more dynamic or more powerful than the Analog Domain M75P. Although the 711 definitely is a fascinating amp, the M75’s more open tonal balance and the faster pace is also highly gripping. Above: audio buddies JW and JC discussing the merits of amps in relation to Belgian beers. Vivids are usually demoed at shows using Mola-Mola amplification. This is no coincidence, as I have been told that both parties agree that their products perform best when combined with each other. Nevertheless, it is understandable that one can grow suspicious of such a thing, and so I am fortunate to be in the position to be able to shed a light on this. Having the Vivid Giya G3 s2 as well as the Mola-Mola Makua preamp and Kaluga power amps on review as well as the Analog Domain and various other amps, I could make comparisons to my heart’s content. As this is a review of the Analog Domain amps I won’t dive deeply into it, but suffice to say that the Mola-Mola amps are indeed very good and do indeed perfectly highlight the Vivid’s strongest points. 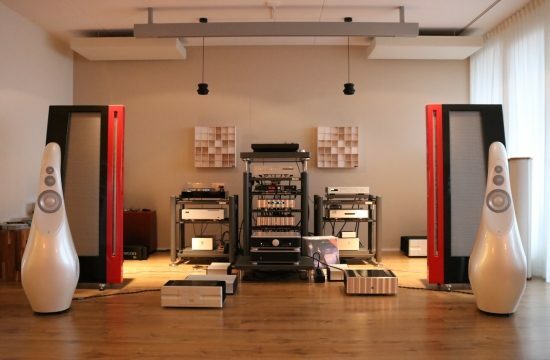 Above: Mola-Mola Kaluga mono power amps surrounded by Analog Domain and Bryston amps. Used with the Vivids instead of the Mola-Molas, the Rowland 625 S2 sounds remarkably full-bodied and seemingly almost as powerful in the bass as the Brystons. Surprisingly it is tonally also similar to the Brystons, but it is more transparent and you do hear more nuance in all the instrumental overtones, most evident in the equally smooth, but more detailed and more clearly textured midrange. It’s still a Rowland of course, so it is still smooth, rich and relaxed and slightly warm. Switching from the Rowland to the Analog Domain M75P, I am presented with perhaps the best blend of qualities so far. Transparency and overall resolution are very high, yet the M75P has Mola-Mola-like bass definition, speed, and pitch. Strike that, I think that its bass is even better! The M75’s midrange is special too, as clean as the Mola-Mola’s, but fuller and richer, and somehow without dulling or thickening, or losing the overall sense of transparency and definition. More neutral than the Rowland 625 S2 but richer and tonally fuller than the Mola-Molas, the Analog Domain is timbrally impeccable. I am placing so much emphasis on timbre because I find it important for acoustical instruments and vocals to sound credible. It really destroys the illusion for me if they sound somehow synthetic. The M75 has a very lifelike tonality while being every bit as open, clean and transparent as it can be. Now it was time to switch from the M75P power amp to the M75D integrated amp. 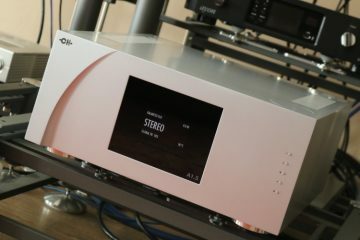 Taking the Corus preamp out of the equation and feeding the Analog Domain M75D integrated amp straight from the DAC, the overall balance is very similar as with the Corus in the chain, but with a little less of that seductive flair, fluidity, and air that Rowland seems to have a patent on. In its place comes a beefier bass and an overall feeling of more solidity and an even more lifelike, and actually live-like presentation. By that, I mean that even though subtle refinement is now less obvious, the overall delivery sounds even more like a live performance. This sound is even more of a whole, more earthy if you will than the more ethereal sounding Corus. Believe it or not, I really love the Corus but at this stage, I was no longer sure which delivery I preferred. Both deliveries sure have their merits. While the MolaMolas are indeed very good, I find especially piano to sound a little more convincing with the Analog Domain especially when using both pre- and power amp sections, not because it sounds richer or warmer or anything like that, but because it better creates the illusion of strings suspended on metal mounted on wood, being hit. In other words, while I can make out all these details just as well with the MolaMola, I find the combined effect more convincing with the Analog Domain. After configuring them this way by means of a couple of switches on the rear and relocating the cables and using a jumper cable, immediately I heard that Hans was not at all exaggerating when he said that the Bridged configuration would be something else. Tightness, drive, power, dynamics, and transparency further increased while retaining all of the amp’s virtues. Oh boy, one amp sounds really great but after hearing them together it’s tough to go back! Regular readers will have read plenty of my adventures with various Apogee ribbon speakers. After having sold the Divas, remaining at this time are only my friend JW’s speakers which are the Duetta Signatures which have recently again been refurbished which is why I refer to them as being “re-refurbished” and the original Centaurs, both on super-extended stay at my place. The Divas sure have made life difficult for me, sounding smooth and relaxed while being capable of portraying the subtlest of nuances but needing copious amounts of power. It’s too bad that the speakers are no longer here to try it but I’m sure that a stack of Analog Domain amps would have been just what the Divas needed. But just for fun, I dragged the smaller Duettas back into position and connected the Analog Domain amps. Whoa, yes indeed, this was pure fun! 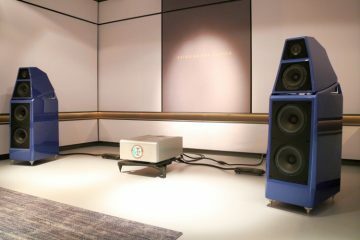 Even in single-ended mode, the Analog Domain amp had excellent control over the Duetta’s woofer ribbon while allowing the midrange to bloom and all the while not allowing the mid-tweeter foil to harden up at any sound level. But when going to bridged mode the fun seemingly doubled! While beautiful before, especially in this mode the performance had a distinct live-like performance. The power and dynamic behavior really was something quite out of the ordinary. The difference between using the Corus and going all Analog Domain was the same as noted above: more airy and refined and more gentle via the Corus, more powerful and tonally pure using the Analog Domain preamp. Much of why I find the Analog Domain amps to sound so appealing I think has to do with the immediate dynamic attack and the lack of blur. They unravel any recording with incredible ease, yet avoid sounding overly clean. Both the M75D integrated and M75P power amp are fast-paced and articulate, highly detailed, incredibly rhythmic and dynamic and lifelike, with power to spare. It’s not all muscle though: they have a highly neutral yet superbly textured and lifelike midrange and smooth, fluid treble. All these terms serve little purpose if they did not culminate in an involving sound, but that’s just the thing: in spite of all the technical excellence, the amps are uncomplicated music makers! So, are they the perfect amplifiers? Allowing for the idea that there may not be such a thing as a perfect amplifier, the Analog Domain amps sure come very close. I have heard amps in my system that possess a more glowing midrange and have more lyrical qualities but these may very well be sins of commission. The question is: do you want the truth, or something prettier? The Analog Domain amps manage to tick all of my required audiophile boxes and sound above all just incredibly honest. One could desire certain editorializing from an amp, for example for it to add extra richness to the music or to make it more soothing by fattening the bass or rounding off the sound altogether. Although the Analog Domain amps possess certain tube characteristics, they are not the equivalent of a typically “tubey” or “phat” sounding tube amps. 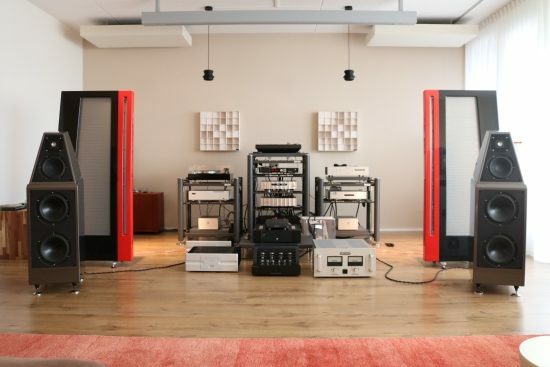 Rather, both amps do incorporate a very big portion of the midrange purity and natural timbre that the best tube designs such as the Vaic Reference 520’s are capable of. Ultimately though, rather than likening the Analog Domain amps to typical transistor or tube amps, I’d say that they sound like no amp at all, and as an added bonus, thanks to their high power and near zero internal resistance, these chameleons are capable of driving any speaker load. Thank you for a very interesting and thoughtful review. I was wondering if you had the opportunity of trying the Mola Mola Makau pre/dac with the Analog Domain Power amp? Hi Robert, I’m afraid that was a combination that I have not tried. Given that AD have an integrated amp with an excellent pre amp built in it’s probably not a combination that people are likely to make. 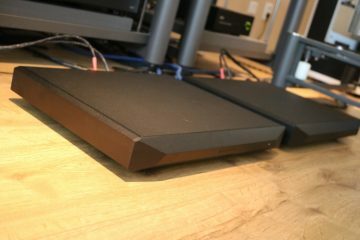 That said the Maku has phono and DAC built in and also sounds very neutral and refined and has superb configurability, even allowing phono settings to be changed from the ipad or remote. Hi Christian, thank you for your reply. Perhaps a more appropriate combination would be Mola Mola Tambaqui/AD integrated. I look forward to reading your review of the Mola Mola Makua/Kaluga in due course. I am delighted with this combination, being both neutral, open and textured with body. Sounds like a very good red wine, tastes. In our direct experience of the Makua pre/dac it has seen off Dave and Nagra and I have read reports of it besting dCS and Weiss dacs. The AD I would like to try sometime but it is a more expensive option if you factor in the extra cost of a dac. 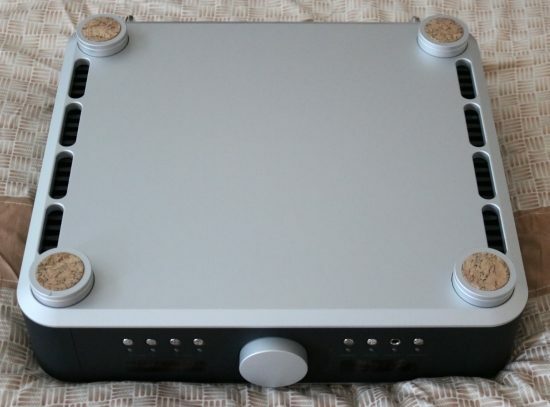 Alas, the Mola-Mola amps will not be reviewed. They were supplied together with the Vivid Giya G3 s2 and only assessed as part of that review. As such I have not done extensive tests such as comparing the Makua’s DA section vs external DACs. I did briefly compare the Makua as a preamp using analog inputs versus the Rowland Corus and it certainly held up extremely well. 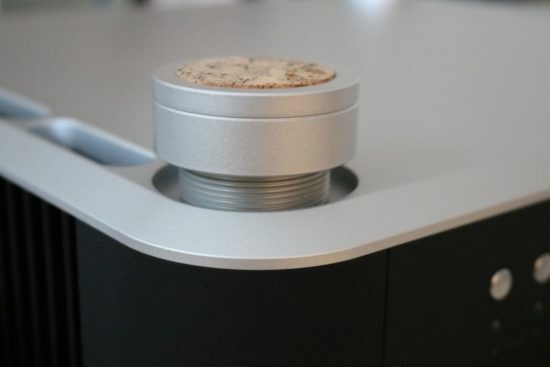 Separately I also used the Makua with its integrated DAC section later, also with great results. My impression of the Mola-Mola products is indeed that of very neutral and refined delivery. The AnalogDomain amps also sound very neutral but are balanced differently. The latter’s presentation (used either as a power amp fed by the Rowland Corus or integrated amp) tends more toward a sonorous and earthy sound while Mola-Mola’s presentation (used either as power amps fed by the Corus or as a complete Mola-Mola system, tends to be airier and more light-footed. The Makua preamp is more neutral in this respect than the Kaluga power amps. Have you tried decent McIntosh amps? I had never heard any til recently and holy-moly… never heard better amplification – huge, smooth, sweet yet detailed, dynamic and utterly transparent. I can’t personally afford them right now, but since you review fairly esoteric gear, they might be worth a listen. So far I’ve only used the MA-6900 in my system. While definitely very good in many areas I found it lacking in fine detail (refinement) and treble air. But that’s not to say that all Mc amps are the same. If I get a chance to listen to a more recent model or a power amp then I will do and report on this. Did you mean the MA6900? If so, it’s a good amp, but well below the price range of what you normally listen to, or review, so not surprised you found it lacking comparatively. Have fun if you listen to a good Mac pre/power, or something like the MA9000! Fair enough! 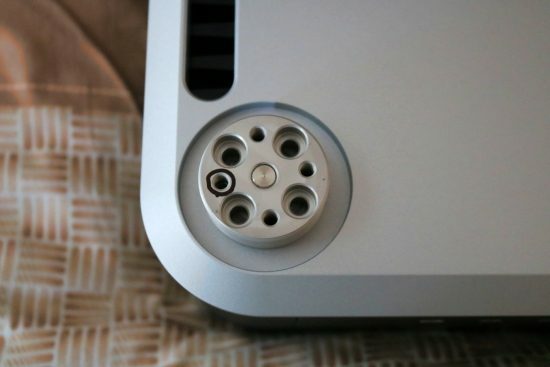 I have a feeling that the lack of refinement, focus and treble air is the price to pay for the high power and great control, not only for this Mac. It’s usually not until you spend gazillions that refinement goes hand in hand with power and drive. That said, I also have a feeling that the darker, rounder, more “global“ sound of the MA6900 may be the Mac company sound. But this remains to be seen if/when I get my hand on higher end Mac products. The progression specs looks impressive. I hope they are not overkill and they worth the double price compared to the Classic. Thanks for the review, I very much enjoyed it! I just bought the Focal Marstro speakers and I am looking for the right amp as those towers are demanding to deliver their best. My main use is 50% music and 50% for home theather movies in kind of Atmos setup. I am getting lost with all the amp alternatives and was about to decide for the new nc611 however reading about rhe M75D is making me think twice. What would be your revommendation? Hi Anas, sorry, I have no clue which amp is referred to with “nc611”. Primary objective: To feel the immersive sound of my BD movies with ATMOS/DTS:X track audio (I use Trinnov 32 as processor. And also I want to have the best of music listening (kind of Daft Punk music). Ah, I see. Well, there is not really a “the best”. All the amps you mention are fine specimens and all can drive the Maestro’s just fine. It comes down to personal taste and which aspects you find most important. The Analog Domain is most neutral and transparent and likely also the most detailed, the Rowland is the smoothest, a bit polite yet still very finely detailed, d’Agostino Classic Stereo is ballsiest but less refined and the Mac is a bit like a mix between modern Brystons and the d’Agostino in overall sound balance. of the four amps, the MC611 and Classic Stereo sound beefiest and provide the most bass pressure, they’re most “impressive”, which I have a feeling may be what you are after for cinema use and maximum Daft Punk impact. If pressed between the two, I’d choose the MC611 over the Classic Stereo, but then again I’d opt for the d’Agostino Progression or Momentum over the MC611. Thanks dear Christiaan for your quick and elaborated reply! In your last sentence “, but then again I’d opt for the d’Agostino Progression or Momentum over the MC611.” Do you mean that in the context of Cinema/Daft Punk listening or you mean for your own personal preference? Did you demo the MC611? I have read that the previous version MC601 was not that convincing performance wise and mostly for Dynamics. Mcintosh claims 50% increase in dynamic. I am open for other alternatives if you have recommendations to at most double budget, however, I don’t need an amp that’s beyond my Focal maestro capabilities. The Focals are very capable speakers and they will benefit from the best amplification that you can get but it depends on your expectations. 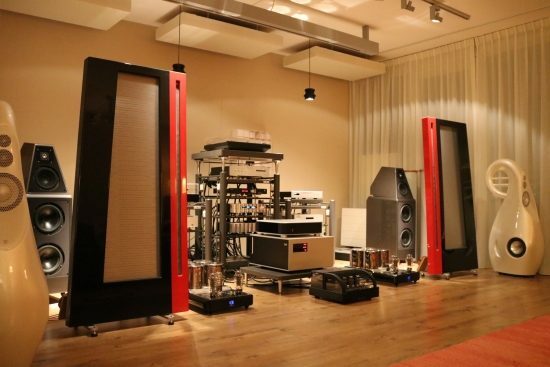 Some people want a powerful sound, others a refined and detailed sound. The Progression is a cut above the Classic Stereo in many aspects and I would prefer it for its overall capabilities, including refinement and resolution. If bass power and dynamics are most important, then Classic Stereo and MC611 are also great options. BTW the 611 is more immediate indeed but that 50% increase should be taken with a pinch of salt:-) Dynamics are a relative phenomenon, everybody perceives this differently and often a “loud” or “energetic” sound is mistaken for being very dynamic. Actual dynamics are not usually perceived as such. In the case of McIntosh, it ties in more with hysteresis, lack of speed and rounding of transients more than actual dynamics per se. Amps with less power tend to be more dynamic (and sound more dynamic, too) than super powerhouses but the d’Agostinos are something of an exception to this. in fact, I’d like to change my advice to not going for these monster Mac Monos but going for Progression or a nice stereo McIntosh such as the MA7000. Truly, you do not need the 1000+ watts that the big Macs have on tap unless you have no neighbors and predominantly play at even higher levels than at cinemas. I posted my answer on the post below! Rich answer from an experienced adviser ? The progression specs looks impressive. I hope they are not overkill for my Cinema use and they worth the double price compared to the Classic. Well, for cinema use you don’t need a superlative amp such as the Progression. For music playback, however, it is much better than the Classic Stereo. The Progression is Powerful, subtle, airy and refined, the Classic Stereo is mostly just Powerful. If I were you I would ask to get both on a demo in your home and decide after that. 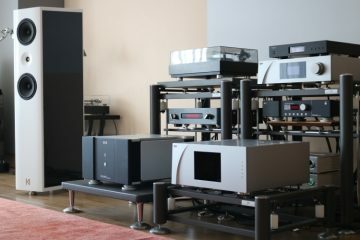 If cinema is the main use, however, then I’d advise to save some cash and get a Bryston 4B SST. You’ll likely be surprised at how good it really sounds, besides being super-powerful. Oh, and you can’t beat that 20-year warranty! Money wise I found 2 deals ending up on the same price on two mono MC611 and on the Dan d’agostino progression stereo. If I get you right, with the Progression I will have the same rich/dynamic/bass/immersive cinematic experience as the MC611 but on the top I will have better music experience, right? I do not watch movies too loud, my Trinnov processor never exceeds -20db as it too much for my 30m2 room. 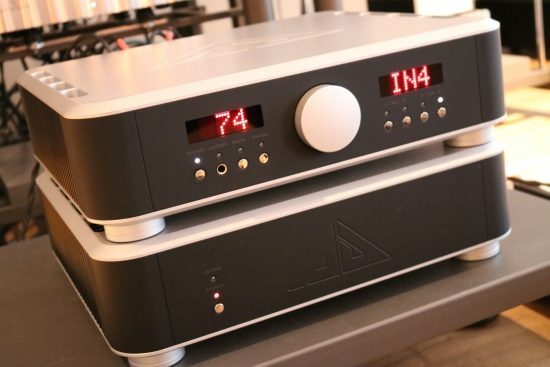 While I have not compared these two amps directly I am pretty sure that Progression will outperform the big Macs or at least equal them on most of their typical aspects, including perceived power, even if the specs don’t seem to indicate this in terms of wattage. But when it comes to power, it’s not only about watts. These amps do not sound the same but yes, I’d say that the Progression will offer the qualities relevant for you (rich/dynamic/bass/immersive and more) of the Macs and add to it more resolution and refinement for a more involving music experience. Indeed, if it were up to me, in your situation and with your preferences I would opt for the Progression over all the other options. Even more dynamic or more articulate sound can be had by using other brands but these will either provide a less fulsome (more analytical) sound or won’t be ideal for power purposes in generic or your cinematic experience in particular, or are even more expensive than the d’Agostino Progression. On balance I think you will be served best with the Progression. Do let me know how you get on! I sent you a private mail if you could please have a look. Hi Anas, having looked at your email, my personal preference and advice to you remain unchanged. Do note that if I were you I would get both the Classic Stereo and the Progression in for a demo and let your ears be the judge. The money difference is too large to let this depend on me:-) Maybe you can also get a Progression amp second hand? Great advice indeed as I am not in hurry I can afford to wait finding the right opportunity. 1st quick search on sale items, there can be great opportunities on the Momentum preamp/amp package!!! I appreciate very much your expertise and dedication dear Christiaan! Honestly, I couldn’t say Anas. I’ve no experience with the Trinnov and have not compared the Progression preamp with anything. From experience with other amps, though, I’d say that bridging does not always lead to better results. Doubling up can have certain benefits but certainly does not always yield a subjectively more powerful sound. Also, I think that a single amp will easily be powerful enough for the Focals. Don’t forget that bridging, while increasing voltage swing, also halves the damping factor and doubles the minimum impedance requirement, so it’s not a cure-all. That’s entirely correct James – when speaking of series bridging. Some amps (the Bryston 7B ST’s for example) can be also bridged in parallel mode, doubling current in the process. But this method is also not a cure-all. More transistors do not always equal better sound. It’s all very relative! Thanks guys for your feedback! Quality is what I am looking for and not too much power as I do not listen too high to music. I didn’t realise Bryston’s allowed parallel bridging – interesting! But yes, I agree, subjective sound quality may well not be better by bridging – and the knee-jerk idea that it will simply give you ‘more of the same’ may well not be the case in practice. Indeed James! Do note: while the 7B ST offered this option, the current SST3 (Cubed) Series do not. I am looking now for the subwoofer setup with the focal maestro for cinematic use. I read the more subs the better. The room is 37m3 and wondering to go ported or sealed . What are your thought? Whats subs you recommend? I have now the B&W DB1D. Congrats, Anas! While I am no any kind of authority on subwoofers I can add the following. While multiples can work better, they can also actually work less well, depending on room interactions. Oftentimes, with asymmetrical rooms or when one side is windowed and the other a (concrete) wall, one or the other wall will work better for a subwoofer, meaning that one sub will be better than two in this case. In general, if the crossover is set low enough (40hz), then they are not very directional at all and using a single sub on the left or right corner works just fine. Also, in general, closed cabinets tend to sound faster than ported ones. As to which brand I can’t really advise as I’ve only ever used REL Strata III and Quake II which are great for the price but I’m sure one can do better. Also read my REL reviews and please comment there if you have further questions. In my search on subs setups I found this one which is quit unusual! Would there be tremendous benefit from this huge subs investment? The subs question is not at all related to the Analog Domain amps. Please can you try and post comments under relevant articles, for example the REL reviews as linked below. You can also always search using keywords via the on-site search. I was lucky to be able to borrow an Analog Domain M75D (int.) for 6 weeks and in my ears the strength of this amp. is the midrange. Speech is very resolved and with a convincing texture, something of the best I have heard from a transistor amp. so far. Acoustical instruments are superb. Treble is soft and fluid, never gets hard or edgy, but I get the feeling that is a little bit rolled off. Would have preferred a bit more air and openness in the top. The bas also give me the impression of being slightly rolled off. Would have preferred more attack and dynamics in the low end. The sledgehammer feels more like a plastic club. It is a little bit too polite overall. Music with high energy never really takes off from the ground. I’m very curious about the Grandinote Shinai. Not so much power on the paper, 37 W, but I have heard some terrific demos. Very fast and natural sounding. Any plans for a review? 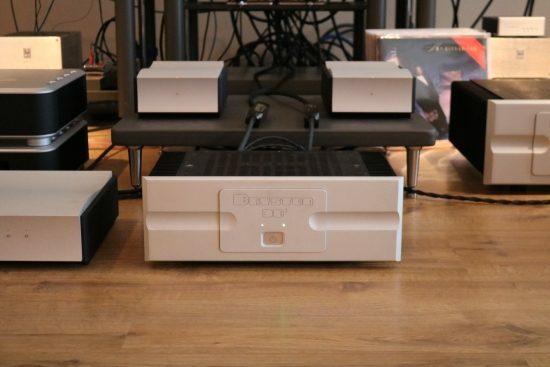 German magazine AUDIO gave the Grandinote mono blocks perfect score, one of three amps. in the 40 years history of the publication. Hi Per, I heartily agree that the midrange is this amps most appealing quality is its midrange and I also agree that there are amps with airier, seemingly more extended, treble. The bass, however, while not the most full-bodied, in my tests with the Apogees and the Wilsons was definitely fast, dynamic and articulate. It’s maybe a little dry, though, indeed in terms of bass, it’s not a Krell, Bryston or Soulution. The Grandinote Shinai looks like an interesting piece indeed. I’ll see if I can get it in for review.